Healthy Vegetarian & Vegan Recipes! Start Your Own Food Blog! Recently, I was sent samples of GO Veggie! Foods line of Dairy Free Products for the purposes of review. I must admit, I have been a fan and have been using a few of the products in my recipes since day 1. 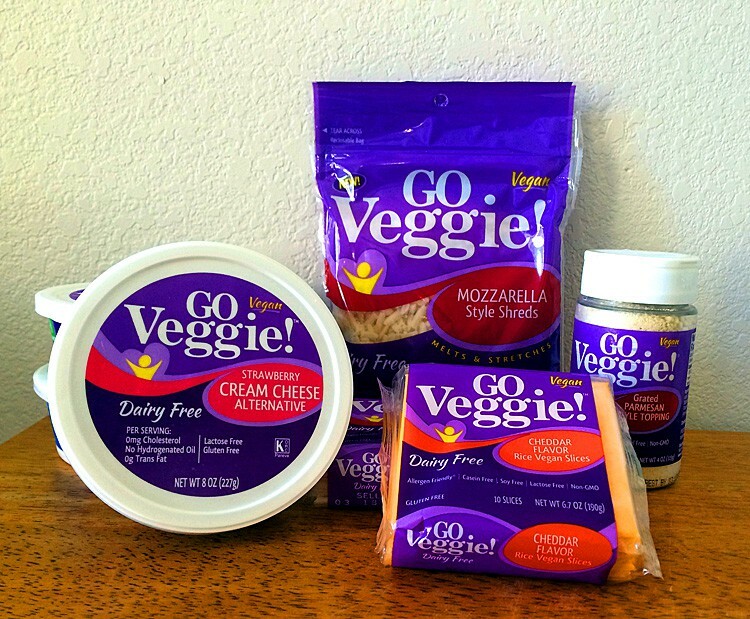 If you’ve been following me for any amount of time, you know that I am in love with the GO Veggie! Grated Parmesan Style Topping. I use it for gratin toppings and my favorite, parmesan fonduta sauce. It’s just that good! I’ve also used the Mozzarella Style Shreds and their Plain Cream Cheese. New to me however, were the Dairy Free Slices available in: Cheddar, American, Pepper Jack, and Mozzarella. The slices are meltable and stretch just like real cheese! These GO Veggie! Slices are plant based, dairy free, gluten free and lactose free. Plus, they half the calories, a third of the fat and 40% more calcium than cheese without the cholesterol and saturated fat. Also in the box were new cream cheese flavors, Strawberry (I’m thinking cheesecake 🙂 and Chive & Garlic (my favorite dip for veggies and spread for bagels). Bottom line – Go out and buy these products right now! You won’t be sorry. This is a quality product line I’ll use over and over again. A sample of the product was sent to The Veg Life! for the purposes of review. The opinions expressed here are my own and any recipes used in the review of this product were not sponsored. Copyright © 2019 The Veg Life! · All rights reserved.